Tahdig (the crust of the rice/ rice cake) is the crown of every Persian dinner table, the pièce de résistance, the side dish that became the main event. Traditionally, jeweled rice is made with a lot of icing sugar and candied carrots and sometimes even oranges. We've simplified the recipe and lightened and brightened it up a bit. Adding dill gives it a lovely earthy tone that compliments all the sweet notes of the berries beautifully. 1. Preheat the oven to 170°C/ 150°C fan/ gas mark 3. Wash the rice thoroughly. To do this, place the rice into a medium bowl, carefully fill with tepid water. Gently (you don’t want the grains to break) swish the rice around, drain the water and repeat until the water is no longer cloudy. Lastly fill the bowl with cold water, add 2 tbsp of salt and allow to soak until you’re ready to cook the rice. 2. Spread the nuts in an even layer on the base of a baking tray and roast on middle rack of the oven until just beginning to brown (around 4-5 minutes). Allow to cool, then roughly chop. 3. Bring a large pot of salted water to the boil, add the rice and cook until the grains have lengthened and are just beginning to soften, but are still firm. Drain, carefully rinse under cold water and allow to cool in a single layer. 4. Combine the cranberries and barberries in a small bowl, cover with recently boiled water and allow to soak for around 10 minutes. 5. Put the saffron in the hot oven for about a minute to dry it out (this makes it easier to grind). Use a pestle and mortar to grind the saffron into a fine powder, melt 4 tbsp butter and combine with the saffron. 6. Heat another 2 tbsp of butter in a non-stick pan, add the onion and fry on medium to low heat until softened and translucent. Add the cumin, turmeric and cardamom. Cook until fragrant, approx. 1 minute. Add dried fruit and nuts and cook for a further minute; set aside. 7. 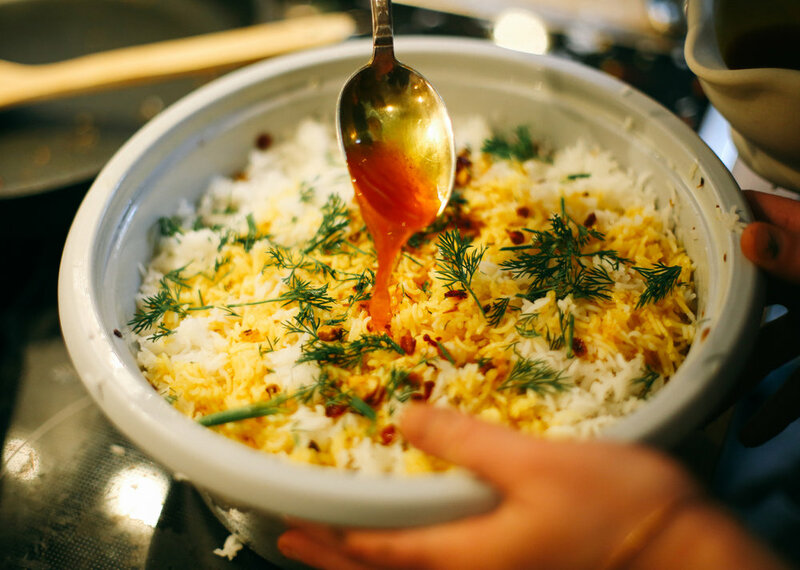 Carefully butter the base of a rice cooker, pour ¼ of the butter-saffron mix onto the bottom of the cooker, add a quarter of the rice, then top with some dill and half the fruit and nut mix, repeat with another layer, finish with a layer of rice and pour over the remaining saffron. 8. Cook in rice cooker. Turn rice over before serving to see the tahdig.